[Nietzsche, the German philosopher, said that "God is dead” and he based it on science and evolution. He said that it would take a few centuries to die. It turns out he saw the future clearly! I want to draw your attention to this chart of religion in Germany. Look at the percentage of Christians in Germany. The Germans were massively Christian, much like the Boers are here in South Africa. 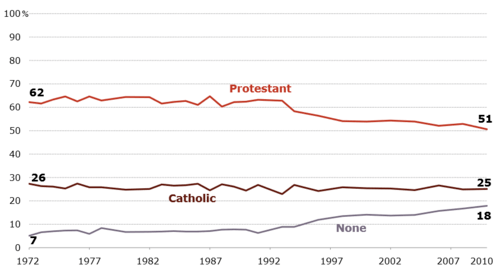 If you look at the percentages (despite the fluctuating population), you’ll see there was a small, but definitely noticeable drop in Christianity before WW2. But the really huge drop took place from the 1960s onwards. This is inline with the trend across Europe. Probably the greatest, bloodiest Christian war in all history, the Thirty Years war, was fought on German soil centuries again. 30% of the population died in Christianity’s World War which was in Germany! The Germans are the founders of Protestantism and they were ardent Christians. But that has been changing. Now look at Christianity in Germany from 1910 to 2011. ← Proof of what really happened to the Jews in NAZI Germany before WW2!! !